Just the right colors for autumn. 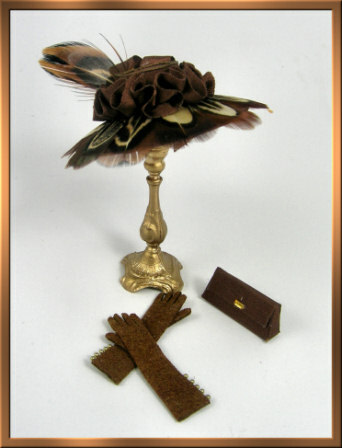 This hat project features a lovely brown silk hat profusely trimmed with silk ribbon loops and reeves pheasant feathers. A matching silk clutch and leather gloves are included in this project packet. Download is in PDF format. It contains complete instructions with dozens of photos, full size pattern pieces for the hat and the hatbox, and full color artwork for the hatbox. You will also receive access to an online video showing the flower making technique.